Influencer marketing seems to be all the rage these days. Every day I receive at least one post, article or link to a whitepaper about influencer marketing. On the surface, it seems like it applies mostly to B2C companies but it can also be very impactful for B2B. Influencer marketing is a form of marketing that has emerged from a variety of recent practices and studies, in which focus is placed on specific key individuals (or types of individual) rather than the target market as a whole. 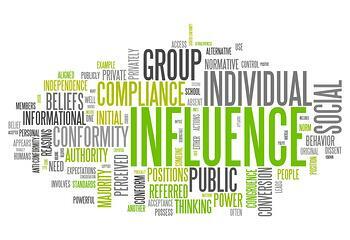 It identifies the individuals that have influence over potential buyers, and orients marketing activities around these influencers. Influencers may be potential buyers themselves, or they may be third parties. These third parties exist either in the supply chain (retailers, manufacturers, etc.) or may be so-called value-added influencers (such as journalists, academics, industry analysts, professional advisers, and so on). I’m sure you’ve heard of “mommy bloggers”. They are the moms who, in addition to blogging about topics related to being a mom, write about products they use as moms and whether or not they like them. This presents a significant influencer marketing opportunity for B2C organizations that manufacture products or provide services that are centered around moms and families. If the right mommy blogger likes and recommends your product or service, it can have a significant impact on sales. The same concept works in B2B but instead of mommy bloggers your influencers are people who are viewed and respected within your industry or the particular vertical you are targeting. Like the Wikipedia definition states, they may not be the actual buyer of your product or service, they may be a third party who has influence within your target market. And influencers are just as important in B2B marketing as they are in B2C. According to Demand Gen Report’s 2014 Content Preferences Survey, 72% of respondents looked to industry peers while researching relevant content for B2B purchase decisions. Testimonials on our own websites are good but we need more. I know what you’re thinking because I’ve thought it myself. Influencer marketing sounds like a great idea and I feel like I better get started before I miss the boat. But, how do I start and where do I prioritize it with all of the other marketing responsibilities I have? Let’s face it, small to mid-size businesses do not have unlimited marketing resources. First things first…influencer marketing like inbound marketing is a long-term strategy and it deserves to have its own plan, just like content. Success will not be as easy as flipping a switch. It will take a sustained, well-planned effort. That said, this is something that is too important to brush aside. To be 100% honest, at Imagine, I am just diving into influencer marketing myself. Here’s how I am getting started. If you don’t understand who your ideal customers are, how can you identify the people who influence them? For the most part, this is a check in the box for me. However, it is important to review and update your personas on a regular basis and I will be doing just that in the very near future. If you are still putting this off, I urge you to sit down with your team and get it done. If you need help, here’s a link to our buyer persona workbook. This is where things get a little harder and will require time and effort. Start by identifying (hopefully this information is included in your buyer personas) where your target audience goes for information. Are there certain blogs they follow? What LinkedIn groups do they participate in? What about industry publications? Who are the industry experts? If you have not identified this info in your personas, then start by connecting with people you know and/or meet in your target market on LinkedIn. Find out who they are connected to. Search Twitter hashtags that are relevant. Are there Twitter chats around industry-related topics? Who is participating in the chats? Start searching for blogs. Identify the writers. Find the best content and start a relationship with the person or people who are creating it. For me, this step is ongoing. I am still working to identify all of the key influencers but have moved on to the next step with a few. Once you’ve identified who the influencers are, it is time to build a relationship with them. Share their content. Provide meaningful comments on their posts. Participate in LinkedIn groups. Interact with them however you are able to. Part of relationship building is providing your own content and keeping it up-to-date. Do you have case studies on your website? Are your social profiles, for the company and your staff, current? Are you sharing your content on a consistent basis? Once you start interacting with the influencers, they may come looking for you. Make sure what they find is something that is interesting and tells your story. Again, this is something I am working towards. Relationship building takes time. One thing I do have more control over is our website. I believe it is in pretty good shape but we are always working to improve it. As it gets better, I believe our influencer marketing strategy will take hold. Like I said before, influencer marketing requires a sustained effort. It is important to be consistent for the long-term. I have seen organizations give up on blogging because they do not see immediate results and that is the wrong course of action. Once you get started with influencer marketing, stick with it. I cannot provide any data at this point for Imagine but as soon as I can, I will. Anything worth having is worth the effort, right? As I get started with influencer marketing, I know it won’t be easy. But I also know the results will be well worth the time and energy I plan to put into it. Look for another post next winter with an update on my progress and results. I’m confident that I’ll have positive news to share.